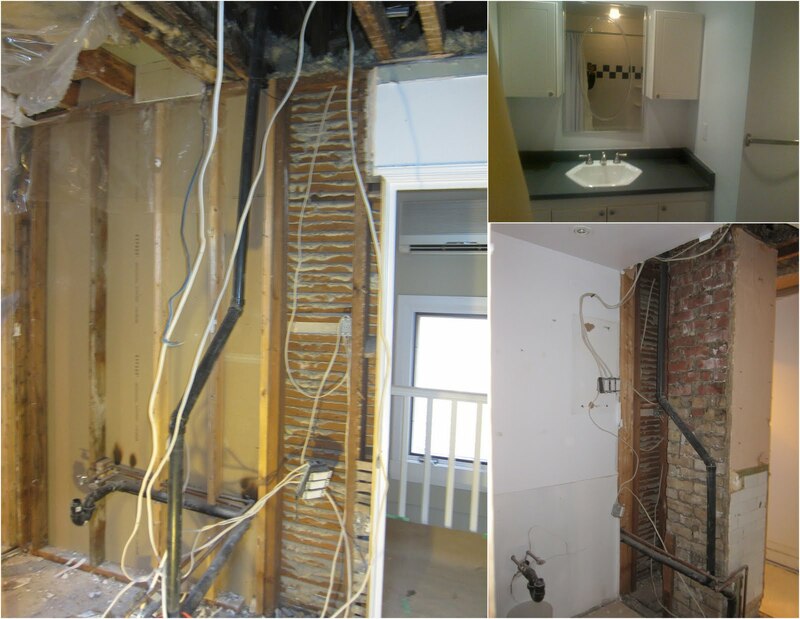 Last week the demolition started on the washroom. I knew the washroom had likely been renovated in 2001 when the addition was put in. My thinking was that since additions are largely big jobs that it would have been done right. Well no such luck. My contractor's favorite phrase is 'hack job'. Look at the pipes at the bottom. You're never supposed to cut into joists - you can bore a hole selectively but not 'hack' into them like that. Any those are new joists from the addition! Now these have to be reinforced. Oh and they were missing support right underneath the toilet, which we've already added. This is a tub area - so there should have been a vapor barrier between the cement board and insulation. As far as I can tell no vapor barrier and likely no cement board either. We'll be replacing this insulation. Top right is the before. It was all drywalled in and made the entrance tight. Bottom right is after removing the drywall. At one time I considered leaving the chimney in because I thought an exposed chimney would be cool. Not this one. It has two different kinds of wallpaper on it plus some subway tile. Final and largest picture is the area without the chimney. Original plaster and lathe wall back there - the rest is the new addition. Oh and see all those wires hanging around. That's the way they were in the drywall. That's also bad. The ceiling of the washroom was lower than any other ceiling because they had not bothered to remove the old plaster ceiling. We decided to get rid of it. Left shows the plaster ceiling and right is after. - when they put up the addition the studs weren't put in evenly so now we'll have to strap them to try to get them level. That's the one week update. More next week. 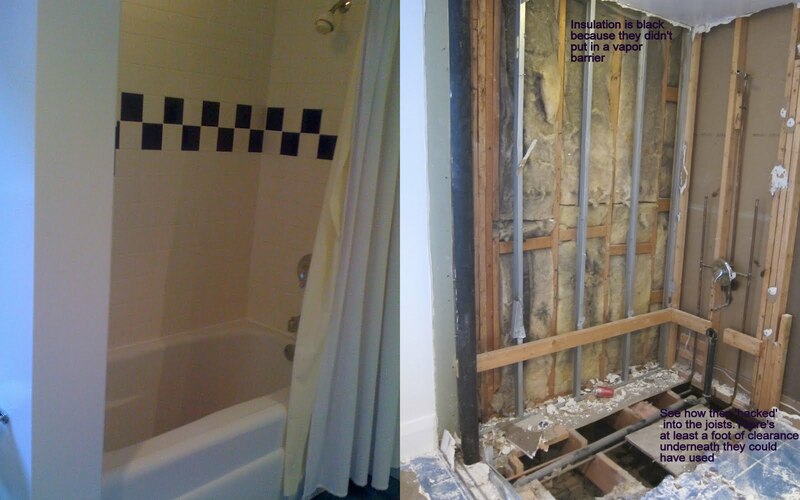 Amazing how fast a bathroom comes down eh?